In epic offshore 4-6′ NW tubes for lefts and rights. Surf should peak 10′ minimum this afternoon. 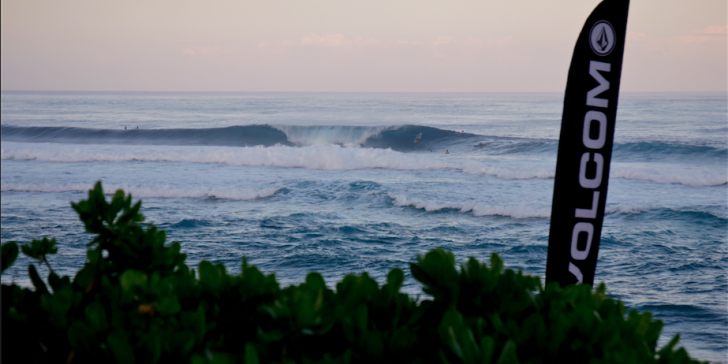 Tons of triple overhead tubes on tap for Tuesday. SNN. Banzai Pipeline, North Shore, Oahu, HAWAII – (Friday, January 29, 2016) — The Volcom Pipe Pro has been called ON with an 8am start after contest officials deemed the 6-8 foot NW-WNW swell and light easterly offshore winds highly contestable conditions for Day 2. The surf is expected to build through the day and reach heights of 10-12+. The competition will kick off with Heat 12 in the Round of 96 with Adrien Toyon (FRA), Nic Von Rupp (PRT), Yujiro Tsuji (JPN) and Imaikalani deVault (HAW). Officials anticipate to finish Heat 13 of the main Round of 64 today, which will see top seeds like Kelly Slater (USA), John John Florence (HAW), and Ian Walsh (HAW) compete. The Volcom Pipe Pro is notorious for serving up epic barreling waves and unparalleled talent, and is a World Surf League (WSL) Qualifying Series (QS) 3,000 rated event. On offer for top finishing surfers is a piece of the $100,000 prize purse, valuable regional ratings points and most importantly, a slot into the Pipe Invitational this December, which could allow qualification into the year-ending Billabong Pipe Masters, the final stop of the WSL Championship Tour. Please anticipate an official press release, video news reel (VNR) and photo package after the competition ends for the day.